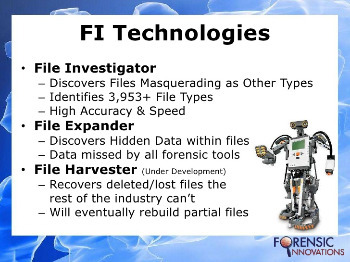 File Investigator Tools portable – reliable, fast, and accurate computer forensic tools. We’ve merged our File Investigator technology with Windows File Find and the DOS Directory command, to search for files by their File Type, Contents, Operating System/Platform, Data Storage Method, File Attributes, plus more. Forget using file extensions, now you can search for files intelligently and browse through their metadata. Added the ability to read Unicode metadata strings, and output them to be used by other applications. The FileInfo.sTextValues array of strings now officially supports UTF-8 enbedded Unicode values. To turn this feature on, add the Store Unicode Flag (FileInfo.lGetDetails += 4) to the GetDetails flags field. With this feature on, you need to detect and translate Unicode characters from UTF-8 to double byte strings. Fixed the inability to Drag and Drop a file, with a Unicode name, on to the FI File Find application. Fixed a buffer over run condition for FIWDir.exe when using the /VM parameter to maximize all column lengths.